I am getting so close to finally completely my kitchen islands! They were supposed to be finished last week, but because of the snowy/icy weather we have had, my contractor had to push back the date he could come until tomorrow. I am really getting excited to see them completely finished, and I think they will be lovely. I finished painting all the accessories for the custom one this weekend, and today I distressed and waxed the one I will be selling at Stylish Patina. That one is shown in the pictures. I painted it in Miss Mustard Seed’s Grain Sack color milk paint. I really love how it chipped and distressed after the painted dried. 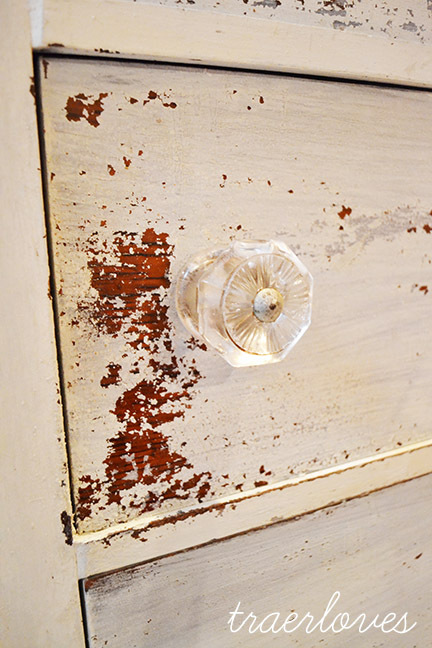 I also installed four vintage knobs, that I had taken off an empire dresser bought at auction, on the front of it. 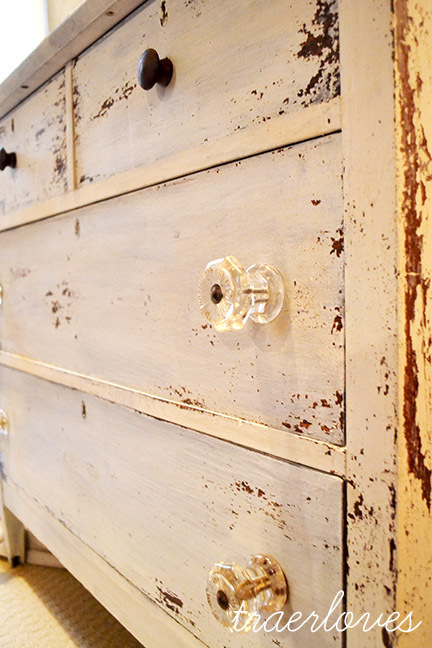 I put two of the original wood knobs on the single drawers for a nice contrast. The top portion of this island will be hickory with a clear coat finish. I am completely in love with this one. And if I didn’t already have an island for my kitchen I would be keeping her. But I thought I would show you a sneak peek of what she looks like so far. The kids are home from school today because of the ice. It has been fun to have a long weekend with them, and I can’t say I am really ready to get back to the routine tomorrow. But for now I will try to be content in relaxing inside my nice warm house with my babies. So maybe tomorrow or the next I will finally have both of these islands completely done and ready to live at new homes. Stay tuned for the grand reveal! I know I have been teasing you for weeks, but I think that is half the fun. Have a wonderful Monday! I love this. I need an island badly and just saw a dresser on my street that someone is discarding. How do I add the top? Mind sharing?